"All of a sudden, everything around us exploded," the boat's captain said. "It was everywhere." A steam-related explosion off Hawaii early Monday sent chunks of lava into the air, piercing the roof of a nearby tour boat and injuring at least 23 people, officials said. 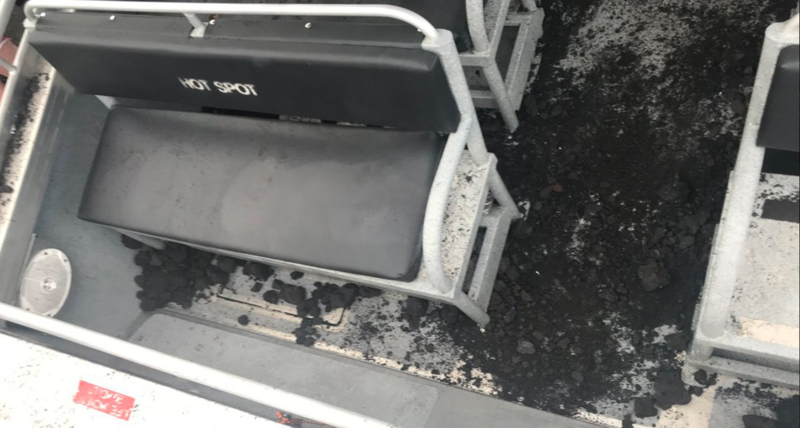 Photos showed the damage and red-hot chunks of lava on the boat operated by Lava Ocean Tours, which is one of just four companies that are permitted to take tours to view the lava entry into the water. A passenger on the boat, Kirk Olsen, wrote on Facebook that a piece of lava rock lodged itself on the handrail next to his elbow. "I was in the boat directly underneath this explosion," he said. "Lava boulders came through the roof. We thought we were going to die." A photo by Kirk Olsen, who was on the boat when it was hit by the lava bomb. A passenger's video showed the terrifying early morning explosion. In the video, people on a boat are watching the glow of the lava when it suddenly explodes. Then everything goes black and people can be heard screaming. The tour company did not immediately respond to BuzzFeed News' request for comment. But Shane Turpin, the owner and captain of the vessel, told the Associated Press that everything seemed normal as he navigated the boat to about 250 yards from the lava. "As we were exiting the zone, all of a sudden, everything around us exploded," he said. "It was everywhere." The so-called lava bombs tore a hole in the boat's roof, damaged a railing, and left molten rock scattered on the floor. 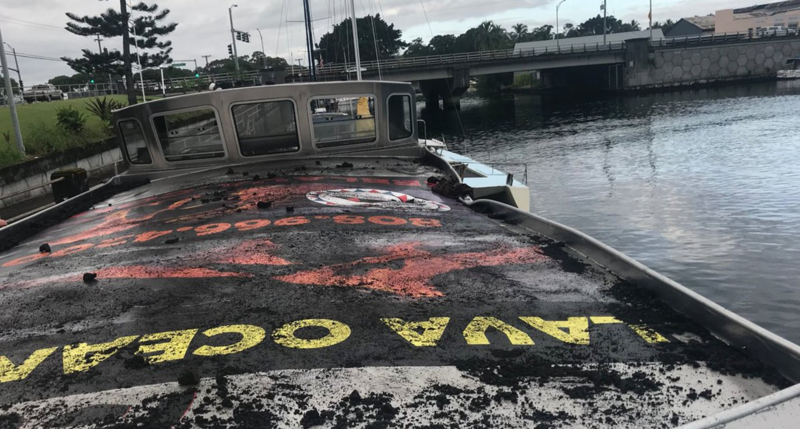 The Hawaii County Fire Department said the boat returned to Wailoa harbor in Hilo with 23 injured passengers, three of whom were rushed to the hospital but later listed in stable condition. However, a fourth woman in her 20s was in serious condition with a fractured femur, fire officials said. Footage by Hawaii News Now reporter Mileka Lincoln showed the tour boat after returning to Wailoa harbor in Hilo. Littoral explosions happen when hot lava and cold seawater interact. These explosions can throw fragments of lava up to 300 meters, according to Janet Babb, a US Geological Survey geologist. The USGS has been alerting people about the explosion and other hazards since late May, when the lava entered the ocean near MacKenzie State Park. A chunk of flying lava hit a man earlier this year and broke his leg. A video by Ikaika Marzo, who works for Kalapana Cultural Tours and has been documenting the ongoing eruption, captured a later part of Monday's explosion. The eruption from Kilauea volcano started on May 3 in a residential neighborhood. About a week later, Hawaii Volcanoes National Park shut down, leaving curious visitors with few options outside helicopter or boat tours to see the active flow. The Lava Ocean Tours cost around $250 and, according to its website, are run by Coast Guard–licensed captains. The tours are described as a way to "see, hear and feel the heat from your front row seat onboard one of our world class catamarans." This video by Ikaika Marzo shows lightning in the clouds above the explosion. Last year, the Coast Guard established a 300-meter safety zone near the lava's ocean entry, but permitted commercial and research ships were allowed to go within 100 meters. Two weeks ago, however, the Coast Guard established new rules to allow permitted ships to go within 50 meters. After the incident, the Coast Guard revised its rules about how close tour boats can get to a lava flow, saying no vessels can go closer than 300 meters, according to the Associated Press. The Coast Guard said in a statement Monday that it is sending an official from Honolulu to Hilo to assist the Hawaii County Police Department and the Division of Conservation and Resources Enforcement with the investigation. Marzo with Kalapana Cultural Tours, which also does lava-viewing tours, said in a Facebook Live video that his company always stays 200 meters away from the ocean entry.